It is so easy when your shoes are comfortable to not walk in other's shoes. I am feeling this even here and now. I get home and I get comfortable and it is out of sight, out of mind. This has been one of the rainiest Junes on record here in Guatemala City. Through the first 20 days of June, we have had rain 18 days. The average rainfall for the entire month of June (during the rainy season) is 250 mm. So far after 19 days we have had about 350 mm! This has caused problems. 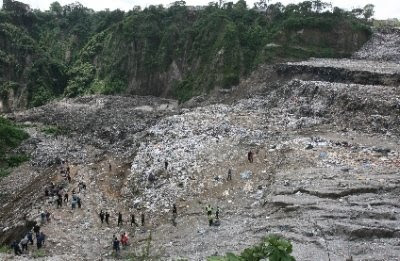 There have been several small landslides that have buried a few houses with several deaths. Last Wednesday, June 18, a section of the large wall surrounding the General Cemetery in Zone 3 fell on several houses killing 3 people. This happened about 2 blocks away from a child center, Casita Benjamin, where we help. There are other problems also in these neighborhoods that I have been asked to help with. Many single mom households, very, very poor area, with roofs that leak, drains that don't drain, etc. I will be meeting later this week with some to see what we can do to help. Then, last Friday, June 20, another tragedy caused by the rain. A large section of the main land fill dump, right alongside this same neighborhood in Zone 3, slid down in an avalanche of garbage and mud. Hundreds of people eke out a living by digging through the garbage daily for anything of value that can be recycled, etc. The avalanche buried many. 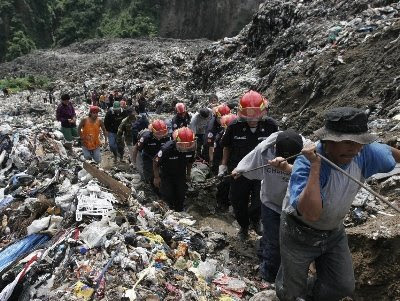 So far they have recovered 6 bodies with at least 18 people still missing. They have called off more searches as the area is still considered a very high risk for more slides. Just to personalize this story, here is a picture of Juana Cecilia Ventura. She is 15 years old. Juana was injured in the land/garbage slide, but will recover. Her mother, Catarina Ventura Ventura, and 10 yr. old brother, Francisco, were killed. Now, she will take responsibility for her 7 younger brothers and sisters. Please pray for these people, and remember all of the people in this wet season when there are always problems with landslides, etc. It is always the poor, where the only available land for them is usually in hazardous areas, that are effected the most. You read a blog like that and you probably feel horrible like I just did. And then their is a crucial moment where you decide to, A. say, "Bummer for them" and then click off the link, B. say a short prayer for them, or C. love them. What does love them mean? How do I practically love them, especially this girl, who is a million miles and a lifetime away? What can I do? Well, the Bible says, Matthew 7:12 (NIV) So in everything, do to others what you would have them do to you, for this sums up the Law and the Prophets. The Bible also says, Galatians 5:14 (NIV) The entire law is summed up in a single command: "Love your neighbor as yourself." So, in this situation, how do we love Juana Cecilia Ventura so that we can do the will of God? Well, what would you want done if you were her? Well, to know that, you have to walk in her shoes, to feel what it must feel like to one, just have lost your mother and your brother, two, to know what it feels like to be living in a dump, and three, to feel the helplessness and discouragement and pain that she must be feeling. And once we have felt that, we then ask, what would I want someone to do if I were her and she were me. And then, what? Galatians 6:2 (NIV) Carry each other's burdens, and in this way you will fulfill the law of Christ. Love is bearing the burdens that you would want bore if you were them and they were you. So, what are WE going to do about this? Thanks so much for posting this Steve, and most of all for the challenge you gave us. Even here, in the midst of it, it is difficult to know EXACTLY what it means to "walk in their shoes"